This blog, video, and podcast are about financial planning software that can help determine how much you need to retire, how much you can spend in retirement, will you have enough for long term care or would insurance be better, etc. See our Video Here. We have been doing retirement calculations with spreadsheets – and decided this year to subscribe to a service to give us another way to look at retirement and spending with clients. This makes the client experience consistent and quality financial plans possible on a large scale. It increases your efficiency and enables you to add value to the planning process based on your experience, knowledge and relationship. simplify client driven data gathering. Select a conversation and send a link to your client for them to input their data. This streamlined process gets needed information directly into the plan. Also explore clients’ expectations, concerns and goals to drive your advice and enhance the quality of your financial plan. Health care costs are one of your clients’ largest expenses in retirement. Our Health Care Smart Goal calculates Medicare Part B, Part D, Out of Pocket Expenses and Medigap specific to your client’s modified adjusted gross income. The health care expense schedule also provides real future health care costs. This feature auto calculates multiple social security options to help identify the strategy that makes the most sense for your client. First year income, lifetime income, break-even points and plan probabilities of success will help educate your client. The selected strategy will then be incorporated into the financial plan. Explore loss tolerance and longevity in the risk feature. Couples can input separate loss tolerances and define an agreeable household number. 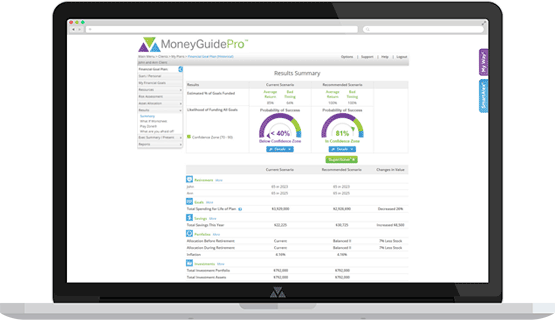 Their sanity check allows your clients’ to evaluate their response to losses. The Risk / Return output allows clients to determine if they are comfortable with their plan. Four ways to solve your clients’ financial plan: Choices, Play Zone®, What If and SuperSolve®. Each of these options allows you and your client to vary elements of their financial plan that gets them into their Confidence Zone. From logical tradeoffs, to focusing on wishes and desired retirement age, this feature helps you provide advice for your client to achieve their retirement goals. Play Zone® allows the client to adjust variables they can control, such as retirement age and lifestyle, see their impact and understand tradeoffs necessary to achieve their goals. Put the mouse in your clients’ hands and allow them to experience the impact of different retirement scenarios. The Client Planning Portal helps clients focus on what’s most important and whether their plan is still on track. The Probability of Success Meter reminds clients of their current plan results and measures their confidence in achieving their goals.